MCL is a rare, aggressive B-cell lymphoma with a poor prognosis. For patients who fail initial therapy, conventional chemotherapy achieves only short-term remissions. Ibrutinib is a first-in-class, once-daily, oral, covalent inhibitor of Bruton’s tyrosine kinase shown to be highly active for patients with MCL. The current pooled analysis from 3 ibrutinib studies (PCYC-1104, MCL2001 [SPARK] and MCL3001 [RAY]) assessed the impact of baseline factors on overall survival (OS) in patients with relapsed/refractory (R/R) MCL. To explore baseline factors impacting OS in patients with MCL receiving ibrutinib. Patients with R/R MCL were enrolled across 3 studies to receive ibrutinib 560 mg orally once daily until progressive disease or unacceptable toxicity. Inclusion and exclusion criteria were similar in all 3 studies; however, patients in SPARK were required to have received both rituximab and bortezomib. Patient-level data from all 3 studies were combined into one database. Simple descriptive statistics were used, and exploratory analyses were conducted using Kaplan-Meier estimates for progression-free survival (PFS) and OS. Univariate and multivariate analyses were also conducted with hazard ratios to allow for comparisons of variables. All patients provided written informed consent. Overall, 370 patients were included in this analysis (PCYC-1104, n=111; SPARK, n=120; RAY, n=139); median age was 67.5 years, 94% had ECOG 0-1, 45% and 32% had intermediate and high-risk sMIPI, most patients had 1-3 prior lines of therapy (27%, 29%, 22% had 1, 2, 3 prior lines of therapy, respectively), 49% had bulky disease (>5 cm) and 88% had non-blastoid histology. Overall response rate (ORR) was 66% (20% CR; 46% PR), with a median DOR, PFS and OS of 18.6, 12.8 and 25.0 months, respectively. ORR (CR) for patients with 1, 2 and ≥3 prior lines of therapy was 77.8% (34%), 71% (24%) and 64% (16%). Of patients who achieved a CR, 70% were progression-free and 90% were alive at 2 years. Univariate analyses showed that patients with 1 vs >1 prior line of therapy had significantly longer OS, with longer OS also observed in those who were younger and had non-blastoid histology (Fig. ), non-bulky disease or better sMIPI score. Patients with blastoid and non-blastoid histology had similar ORR (55 vs 72%) and time to best response (2.2 vs 2.1 months); however, DOR (8.6 vs 18.8 months), PFS (5.1 vs 14.6 months) and OS (12.8 vs not reached) were significantly shorter in patients with blastoid histology. Multivariate analyses identified ECOG, sMIPI, bulky disease and blastoid histology as impacting OS, and sMIPI, bulky disease, blastoid histology and 1 prior line of therapy as impacting PFS. Here we show that OS is significantly longer in ibrutinib-treated patients who are younger and who have fewer prior lines of therapy, better sMIPI scores, non-bulky disease and non-blastoid histology. 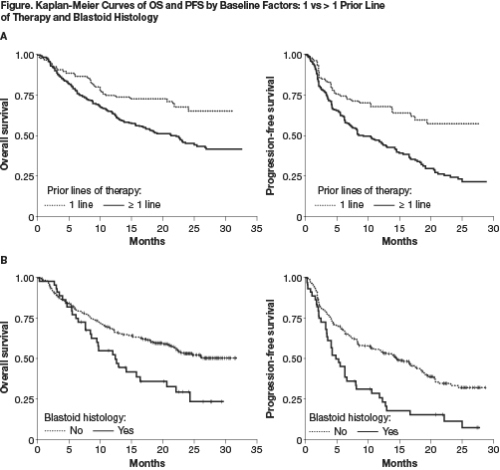 While PFS and OS in patients with blastoid vs non-blastoid histology are shorter, these rates are higher than seen with other agents, indicating that ibrutinib is an effective agent to achieve a response and potentially provide a bridge to transplant. Multivariate analyses indicate that traditional poor prognostic factors adversely impact OS, suggesting that worsening OS in later lines of therapy is associated with disease characteristics rather than an impact of ibrutinib on postprogression survival. Data support the preferential use of ibrutinib after initial vs later relapse, as PFS and OS are longer in patients receiving 1 vs >1 prior line of therapy.